Why Do Social Networks Increase Stress? It's hard to remember life before social media. How did we ever know what our distant, high school friends' kids looked like? Or what they cooked their family for dinner? Or the fabulous places they visited on their seemingly-bi-monthly tropical vacations? Although Facebook and Twitter feel almost ubiquitous today, according to the Pew Foundation, only 60 percent of Americans belong to a social network (For the record, our data says 61 percent but we'll defer to Pew). Shockingly, that means well over one-third of people in the U.S. may never see a picture of their niece's swimming trophy or know if that guy they met at the conference is nearing his two-year job anniversary. But, are the 40 percent of Americans who are un-networked really worse off? Are the active tweeters and status updaters living a more enriched life or a more stressful one? We dug into our piles of data to shed some light on these questions. 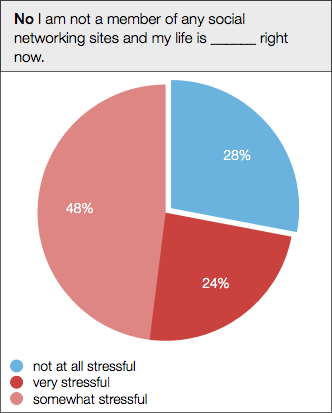 We quickly found that social network users are, in fact, 14 percent more likely than non-users to characterize their lives as at least "somewhat stressful." 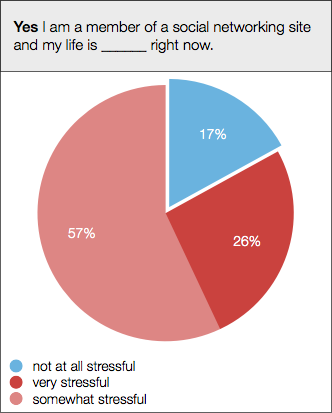 Non-users, conversely, are 28 percent more likely than users to say their lives are "not at all" stressful. Clearly, there is a strong association between social media and stress, but why? I'm glad you asked. Like it or not, social media is one of the most prevalent ways people learn about new movies, music, fashion, books, or other products. Twenty-eight percent of people say their friends on social media influence the music they listen to, 36 percent the TV shows and movies they watch, and 36% the brands and products they buy. All of this influence appears to correlate closely with stress. People who say social media influences the products they buy "a lot" are 45 percent more likely to say their lives are "very stressful." Maybe we can't afford all the fancy new products our friends are buying. Maybe we're too busy to follow the trends in music or fashion. Whatever the reason, it's evident that the more we pay attention to our friends' activities, tastes, and possessions, the more stress we report in our lives. KEEPING UP WITH YOUR "SELF"
There's a secondary, if unconscious, effect of all this social media influence: We feel pressured to portray our ideal selves for everyone to see. When surveyed, 40 percent of social media users admitted they often post/share things to improve their image. Honestly, how often do you see someone check-in at Dollar General, boast about their job demotion, or post pictures of the frozen chicken nuggets they microwaved for their kids? Seldom, right? Instead, we tend to highlight the positive aspects of our lives and personalities, if only to compete with everyone else who is doing the same thing. This need to measure and curate our social media persona has a strong association with stress. People who say they post things on Facebook or Twitter to improve their image are over 4.5 times more likely than other people to "always" feel stressed. Social network users who are "very concerned" about consumer privacy are 20 percent more likely to characterize their lives as "very stressful." 83 percent of people believe Facebook does the worst job of protecting their privacy, compared to 11 percent who say Google, and 6 percent who say Apple. 69 percent of Facebook users do not believe the social network does enough to protect privacy. 77 percent of Americans do NOT believe employers should be able to review Facebook profiles as part of the job application process (even though they do). Obviously, most people with extreme privacy concerns never join social networks in the first place. That might just be too much anxiety for them to handle. Finally, simply being "plugged in" all the time is a major stress-driver. Consider that 51 percent of U.S. adults admit to being addicted to their digital devices, which they use primarily to be connected to the rest of the world. These addicts are 32 percent more likely than non-addicts to consider their lives at least somewhat stressful. What's more, social network users who are addicted to their digital devices are 76 percent more likely than average to say their lives are at least somewhat stressful. Using free services like Twitter or Facebook is a trade-off. We get to keep in touch with friends and read some great content; but we lose a lot of discretion and privacy as a result. We just need to keep it in perspective. Remember the earlier stat that 40% of people post things to improve their image? When asked the question differently, 77% of people (almost 2X more) believe that their friends DO post things to improve their image. You know your friends' lives aren't any more perfect than yours, so don't let it stress you out. Put down your device every once in a while and enjoy the life you have.